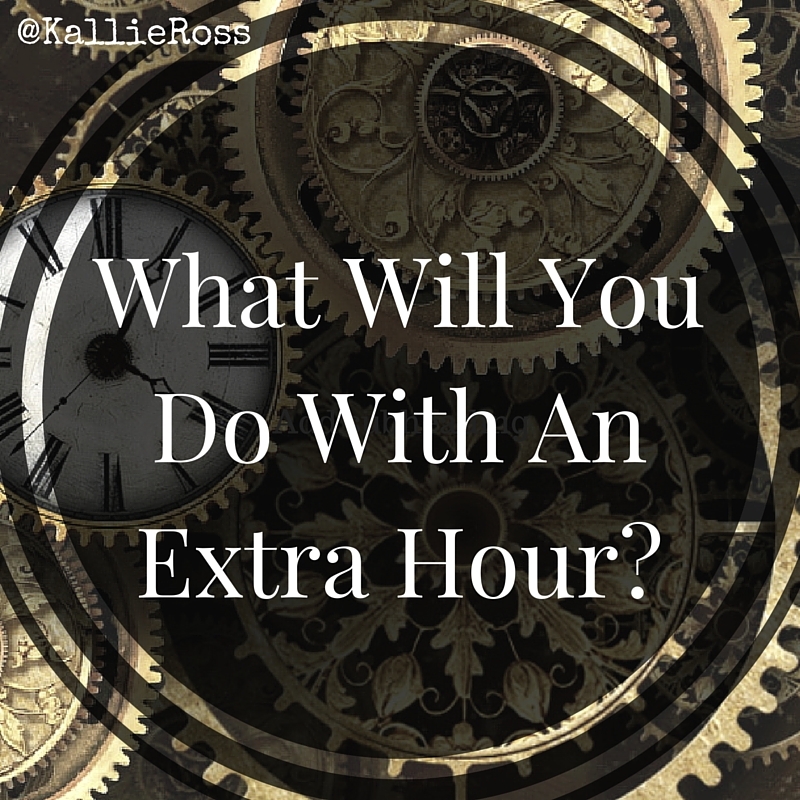 What Will You Do With An Extra Hour? 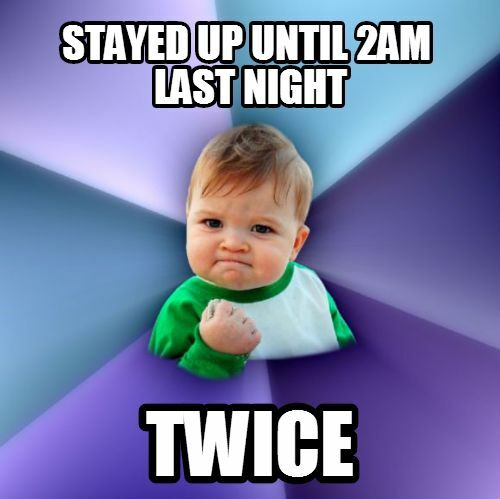 Daylight Savings is upon us and since it’s Fall I’ll be falling back into bed… Or will I? This extra hour is what I pray for every day, so why am I not using it? The struggle is real. There are so many posts and updates and tweets and videos suggesting how we should manage your time. We should be creating a schedule for our writing or planning writing retreats. Everyone should join a writerly Facebook group or follow a hashtag to challenge ourselves with writing sprints. If all else fails we sit in our favorite chair, open up the laptop, and wait for inspiration to hit. These things help us move through our stolen writing times, but are they effective? 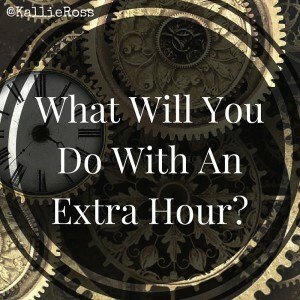 Are we utilizing every hour of our day? What difference does an hour really make in the great scheme of things? 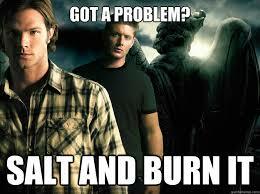 I could watch an episode of Supernatural on Netflix, get a load or two of laundry done, or write a couple hundred words. For most of us, an extra hour wouldn’t be the game changer we’d hoped for. We would still persist to do the same things the same ways we always have. But, what if I did something different? What if I devoted that extra hour to someone else? If I’m being honest the solitary hour would be nice in theory, but if I dedicated that time to a person or family in need it would be nice times a thousand. You know when someone does something unexpected and selfless for you, it revolutionizes your day. The act can change your perspective. Why isn’t helping someone else with our extra hour the first thing we think to do? As givers, the focus can be taken off ourselves and we can gain perspective. Have you ever noticed that when you look at yourself in the mirror everything around you in the reflection is out of focus. We can’t get a good look at anything– our writing, family, work– if we’re only willing to look ourself in the eye. What can I do with an extra hour? I’m glad you asked, because I have a few ideas. Use your TALENT: Whatever you’re good at, make it your gift to someone else. Bake a busy single mom a casserole, offer to promote someone’s work to your audience, write a struggling friend an encouraging note, make a sack lunch for the homeless person you pass every day to work. You get the picture. Go out of your way: You can do a lot in an hour, but maybe it’s more about meeting the needs of others and not the amount of time it takes. You could mow your neighbor’s yard, offer to babysit while your friend enjoys a blissfully quite trip to the grocery store, clean out your closet and donate some clothes to the organization of your choice, wake up early and serve breakfast at a homeless shelter. These are tasks that might take you out of your comfort zone, but what better way to get better perspective? Don’t do it alone: Accountability is a beautiful thing, but so is sharing the experience of giving. Get your friends/neighbors together and clean up your neighborhood, as a family make ‘Thank You’ cards for deployed military, work with your colleagues to partner with a school or after-school program and provide supplies. It may seem daunting at first, but the more people get involved the easier it becomes. You may take a nap this Sunday to celebrate Daylight Savings, but I hope you’ll also consider taking time to get a good look at your surroundings.